The following comes from a Dec. 30 story in the Phoenix Catholic Sun. The family — husband, wife and any children they may have — is an image of the Most Holy Trinity, the bishop writes, citing several recent popes. By its very nature, “your family” is a communion of love and life. A very inspiring bishop! A wonderful spiritual shepherd, for his flocks! LOVE his explanation of the good example, in Catholic Marriage and Family life, of his wonderful, beloved Catholic parents! Thanks. I posted the link because I’ve found it to be a powerful document that speaks to the male psyche. I’ve read it many times. I was blessed to meet Bishop Olmsted last year and speak with him briefly. I thanked him for “Into the Breach” and look forward to reading his latest exhortation. He is a very fine bishop. 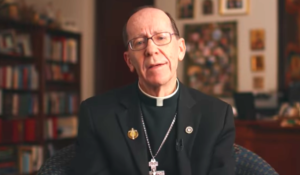 Let us continue to pray for him and all of our bishops. Bishop Olmsted is terrific! Today, I spoke with a young (non-Catholic) 3rd grade teacher, from a nearby Catholic school. She said she has only been to maybe one Mass, and asked a few questions about it. I recalled a favorite nun who taught 3rd grade at our parish school, long ago. Suddenly– I felt badly, about today’s Catholic schools– worthless! We need good Catholic parents and schools– for our Church, today!